Do you run an online store and want to send out regular sales newsletter to your customers? You’d probably love to do that, but you think that it will take too much time. With the 1-click product transfer feature offered by Newsletter2Go, you can transfer product information directly into the newsletter. Start creating newsletters in no time. In order to use the 1-click product transfer feature, you need to connect your shop to Newsletter2Go. You can connect your online store with a premium template. If you’d like to see some newsletter template examples (some of which include the feature), check out the newsletter template examples overview website. This template will contain a special product block, which allows you to transfer your shop products. All you need to do is to enter the product ID or number in this block. Then, the entire product will be automatically transferred into the newsletter. The 1-click product transfer is available for a variety of e-commerce systems and custom interfaces. If you can’t find your system interface, please contact us. Moreover, 1-click content transfer is also available for CMS systems. Allow for a quick and smooth product integration into the newsletter. 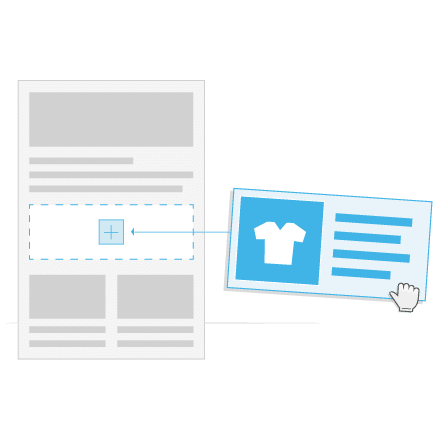 1-click product transfer helps you save time on newsletter creation. Forget about copying and pasting shop products into your email campaign. No more customizing and formatting. Now you can draft a professional campaign thanks to a smooth product integration into your newsletter under a few minutes. It’s up to you what will your individual newsletter template look like. It will be implemented according to your wishes. If you’d like to see a template in your corporate design, so be it. However, if you don’t have a clear design idea, we are happy to take over the newsletter design for you. You can insert the block at any time and move it wherever you want with our intuitive drag & drop editor. The template that contains the 1-click product transfer feature sits in your Newsletter2Go account and can be used repeatedly. Please Note: If you’d like to use the 1-click product transfer feature, you need to order an individual premium template that is integrated with your webshop. You can order it in your Newsletter2Go account or via email: moc.o1556129926g2ret1556129926telsw1556129926en@se1556129926las1556129926 and tell that you’d like to activate the feature alongside template creation. The feature block will then be incorporated in the template.